© 2019 Mahowald et al. Prior studies of Peripartum Cardiomyopathy (PPCM) are limited by short-term follow-up. Contemporary long-term outcomes and change in myocardial function over time are poorly characterized. This retrospective cohort study included women with PPCM at the University of Michigan (2000-2011), with follow-up on March 31, 2017. Subsequent pregnancies were excluded. Recovery was sustained left ventricular Ejection Fraction (EF) ≥55%. Major Adverse Events (MAE) included death, cardiac transplantation, left ventricular assist device, or inotrope-dependence. A total of 59 women were included (mean [SD] age at diagnosis, 29.5 [6.8]; 28.8% Black), with a mean follow-up of 6.3 years. Recovery occurred in 22 women (37%); of these, 8 women (36%) had delayed recovery (>12 months). All cause mortality was 20% (12/59) with median survival 4.2 years; of these, 9 women (75%) died after the first year (range 2 - 10 years). MAE occurred in 19 women (32%); of these, 11 women (42%) had MAE >12 months from time of diagnosis (range 2-20 years). Deterioration in EF by >10% from the time of diagnosis occurred in 16 women (27%). This group had worse long-term outcomes, including lower final EF (mean 25 vs 42%, p=0.010), less recovery (12 vs 46%, p=0.016), and higher rates of death (38 vs 14%, p=0.046) and MAE (56 vs 23%, p=0.016). Women with PPCM have long-term risks of mortality, MAE, and subsequent decline in EF, even in the absence of a subsequent pregnancy. Deterioration in EF is associated with adverse events; thus, long-term management is important. Keywords: Peripartum cardiomyopathy, Women, Non-ischemic cardiomyopathy, Outcomes, Post-partum cardiomyopathy, Pregnancy-associated cardiomyopathy. Peripartum Cardiomyopathy (PPCM) is a distinct cause of heart failure that can have devastating consequences in young, previously healthy women. PPCM causes Left Ventricular (LV) systolic dysfunction towards the end of pregnancy or in the months after delivery in the absence of other forms of cardiac disease or reasons for heart failure . While some women recover, others have persistent LV dysfunction and may suffer adverse cardiac events. Significant variation in reported rates of mortality and recovery exist, and studies are often limited by small sample sizes, short follow-up, non-contemporary era treatment, or reliance on inpatient discharge level databases [2-9]. Early studies suggested that recovery frequently occurs within the first 6 months [10, 11], but studies with longer follow-up found that delayed recovery can occur beyond 12 months or even several years after diagnosis [12, 13]. However, little is known about whether delayed deterioration in LV Ejection Fraction (EF) occurs over time, particularly in the absence of a subsequent pregnancy. While prior studies have demonstrated the risk of relapse and deterioration during a subsequent pregnancy , the long-term outcomes among patients without a subsequent pregnancy have not been well-studied. The Investigations of Pregnancy-Associated Cardiomyopathy (IPAC) prospectively studied outcomes at 6-months and 1-year among 100 women with PPCM ; however, long- term outcomes remain poorly understood. A small retrospective cohort study with mean follow-up of 29 months suggested that women with PPCM and recovered cardiac function did not decompensate even after withdrawal of heart failure medication , but further studies of long-term outcomes are needed. We sought to determine the long-term outcomes of women with PPCM and to analyze the pattern of myocardial function measured by EF over time. Furthermore, we identified a cohort with subsequent deterioration in EF and we analyzed the risk factors associated with deterioration and differences in their outcomes. This was a retrospective cohort study conducted at the University of Michigan Health System, a large tertiary care academic center, where high-risk pregnancy services and advanced heart failure therapies are available. Approval was obtained from the University of Michigan Institutional Review Board. Patients 18 years of age or older were identified using diagnostic codes for PPCM (International Classification of Diseases, Ninth Revision code 674.5x) from January 1, 2000, to December 31, 2011. Each medical chart was thoroughly reviewed until March 31, 2017. Patients were included if they met previously defined diagnostic criteria for PPCM . Patients were excluded if they had another identifiable cause of heart failure, such as congenital or valvular disease, cardiotoxic chemotherapy, viral myocarditis or drug-induced cardiomyopathy. Patients were also excluded if they had recent drug use, recent febrile illness, insufficient medical information or follow-up, or lack of confirmatory echocardiographic data. Since deterioration in LV function is a well-recognized complication that can occur during a subsequent pregnancy , all data from subsequent pregnancies were excluded in this analysis; therefore, our results reflect the natural history of PPCM without including the incidence of LV deterioration during a subsequent pregnancy. In the event that a woman had a subsequent pregnancy, the final EF prior to the next pregnancy was taken as the final measurement and no further data was collected for these patients. Major Adverse Events (MAE) were defined as death, cardiac transplantation, left ventricular assist device (LVAD), or inotrope-dependence. Inotrope-dependence was defined as end-of-life treatment in which women who were not candidates for advanced therapy, such as LVAD or heart transplantation, were palliated with continuous inotrope infusion (i.e. milrinone that could be infused continuously at home). Recovery was defined as EF ≥55% at the conclusion of follow-up. Some prior studies have used EF ≥50% [11, 15-17], but the higher cut-off may be a more reliable echocardiographic standard of recovery and, moreover, is not typically used as the lower limit of normal . Initial EF was recorded as that obtained from the echocardiogram at the time of PPCM diagnosis. Final EF was recorded as the last EF before MAE or before a subsequent pregnancy or at last follow-up. Peak EF was the highest EF recorded during the follow-up period, excluding any EF measurement post-transplant. Delayed recovery or improvement was defined as an increase in EF beyond 12 months after diagnosis. Patients were considered as hypertensive if they were diagnosed with chronic or gestational hypertension prior to or during the index pregnancy. Patients were considered as diabetic if they had a diagnosis of type I or type II diabetes mellitus or gestational diabetes prior to or during the index pregnancy. Medication use was recorded based on the medications listed in the electronic medical record during the follow-up period. Categorical variables were compared using the chi-square analysis or Fischer exact test. Continuous variables were compared using the two-tailed t test or Wilcoxon rank sum test. Odds ratios and 95% Confidence Intervals (CI) for variables associated with long-term outcomes in PPCM were calculated using logistic regression. Kaplan-Meier curves for survival and adverse outcomes were created and compared by log rank test. Start time was the date of diagnosis and the end time was the date of the major adverse cardiac event or were censored at last available follow-up date or a subsequent pregnancy. Statistical analyses were performed using STATA 13 (StataCorp 2013. Stata Statistical Software: Release 13. College Station, TX: StataCortp LP.) and SPSS 23.0 (IBM Corp, Armonk, NY). Dr. Davis had full access to all data and takes responsibility for its integrity and the data analysis. A total of 93 women with a diagnostic code of PPCM during the study period (2000-2011) were identified. After reviewing each medical record, 34 women were excluded for having EF >45% (n=16), insufficient documentation (n=8), or an alternate diagnosis (n=10) (Fig. 1). A total of 59 women met the inclusion criteria and each patient record was reviewed for follow-up through March 31, 2017. Baseline characteristics are shown in Table 1. The mean age was 29.5 ± 6.8 years (range: 18-44 years). A total of 17 women (29%) identified as Black and 34 women (58%) as White. The ethnicity of the remaining 8 subjects self-identified as follows: 1 Asian, 1 Hispanic, 3 “Other”, 3 “Unidentified”. The most common comorbidity was hypertension, which was identified in 21 women (36%). The mean duration of follow-up was 76 ± 7.8 months (6.3 years). The majority of patients received treatment with a beta-blocker, angiotensin-receptor antagonist or aldosterone receptor blocker and diuretic. Only two patients were treated with bromocriptine. Mean EF at diagnosis was 21% ± 11% (range 7-45%). There was significant variability in the change from initial EF to final EF (Fig. 2). Fig. (1). Patient cohort, reasons for exclusions, and overall outcomes. Eighteen women (30.5%) demonstrated some degree of improvement (increase in EF of at least 10%) from the initial EF during the follow-up period. Sixteen women (27.1%) had a decline in EF of 10% or greater during the follow-up period, and 14 women had demonstrated improvement from the initial EF prior to the deterioration. Prior to their EF declining by more than 10 percentage points, 7 of these women had recovered to an EF of 50% or higher, and 5 of them had recovered to an EF of 55% or higher (Fig. 1). In comparison with women who did not have a significant decline in EF, there were no significant differences in mean duration of follow-up, age at diagnosis, race, baseline EF, preeclampsia, and cardiac medications (Table 1). The group that deteriorated was less likely to have hypertension (12 vs 44%, p=0.016). The group with significant deterioration had worse long-term outcomes, including lower final EF (25 vs 42%, p=0.010), lower rates of recovery (12 vs 46%, p=0.016), and higher rates of death (38 vs 14%, p=0.046) and major adverse cardiac events (56 vs 23%, p=0.016). Fig. (2). Initial and final left ventricular ejection fraction for women with peripartum cardiomyopathy. Table 1. Overall cohort and comparison of groups without vs. with deterioration in EF. Recovery, defined as EF ≥55%, occurred initially in 27 of the 59 women (46%) but was only sustained by the end of follow-up in 22 women (37%). Thirty-seven women (63%) did not achieve and/or maintain a normal EF by the end of follow-up. Patients who recovered had a higher mean EF at diagnosis (24 vs 15%, p=0.015) and were older at diagnosis (33 vs 28 years, p=0.014) (Table 2). On univariate logistic regression analysis, older age (unadjusted OR 1.12, 95% CI 1.02-1.23, p=0.02) was associated with recovery. Baseline EF (unadjusted OR 1.06, 95% CI 1.01-1.12, p=0.02) was mildly associated with recovery (Table 4). While lower initial EF was more common among women who did not recover, there was significant variability. There was no significant difference between B-type Natriuretic Peptide (BNP) levels (mean± SD) at the time of diagnosis among those who recovered (1400 ± 2011 pg/mL) and those who did not recover (1369 ±1440 pg/mL) (p=0.956). Of the 22 women who recovered, only 9 recovered within 6 months. Eight women had delayed recovery, defined as EF ≥55% at 12 months or later, and 4 of these women did not recover until after 2 years (25, 40, 69, 121 months). Mean time to recovery was 18.6 months (1.6 years), range 1-121 months. The median time to recovery was 8 months. After excluding the 2 highest outliers (recovery at 69 and 121 months), the mean time to recovery was 10 months. In order to compare our results with prior studies that have used an EF cut off of 50%, we performed additional analysis and found that 25 (42.4%) of women recovered using this cut off. Since prior studies also had shorter duration of follow-up, we determined that when EF assessment was limited to 12-months of follow-up, the recovery rate was 43.2% (for EF ≥50%). Twelve women (20%) in this cohort died during the mean follow-up period of 6.3 years, with mean survival of 4.3 years (range 3 months to 10 years) (median survival was 4.2 years). At 12-months, the overall mortality rate was 5.1%. Of the 12 women who died, 25% (3 of the 12 deaths) occurred within the first year at 3, 7, and 11 months. Seven of the 12 deaths (58%) occurred later than 4 years after the diagnosis. Five of the 12 women who died (42%) had deterioration in their EF by at least 10%. The causes of death were as follows: end-stage heart failure (not a candidate for heart transplantation) (n=6), ventricular tachycardia cardiac arrest (n=2), pulmonary embolism on extracorporeal membrane oxygenation (ECMO) (n=1), hyperacute rejection after heart transplantation (n=1), multi-organ failure with EF 20% and sepsis (n=1) and intracranial hemorrhage (n=1). Kaplan Meier survival curves are shown in Fig. (3). Mean survival was not significantly different for women with initial EF <25% when compared with those with EF >25% (p = 0.2). White women had longer mean survival than Black women (211.0 ± 14.5 months, 95% CI 183.4-240.0 vs 91.2 ±16.0 months, 95% CI 59.9-122.5), with significantly different Kaplan Meier survival curves (p=0.004) (Fig. 3). Table 2. Characteristics of women with peripartum cardiomyopathy with Recovery vs Non-Recovery of myocardial function. Table 3. Major adverse events in women with peripartum cardiomyopathy. Table 4. Univariate Logistic Associations for Recovery and Major Adverse Cardiac Events. Nineteen women (32%) had 36 major adverse events, including death (n=12), cardiac transplantation (n=5), LVAD (n=10), and chronic inotrope-dependence (n=9). Black women had more adverse events (Table 3). Univariate logistic regression demonstrated that Black race was significantly associated with major adverse events (unadjusted OR 0.18, 95% CI 0.043-0.7, p=0.014). Other predictors, including baseline EF, were not significant and there was considerable variation in initial EF among those who had a major adverse event. Hypertensive disorders and pre-eclampsia were not associated with adverse outcomes (Table 3). Women who had significant deterioration in EF by at least 10% had higher rates of major adverse events (56 vs 23%, p=0.016) (Table 1). The majority of the major adverse events in this cohort occurred after the first 12 months. The mean time to MAE was 4.3 years (range 17 days to 20 years). The median time to MAE was 12.8 ± 1.7 years. Only 3 of the 19 women (16%) with MAE experienced their first event within the first 6 months from time of diagnosis. An additional 5 women suffered MAE between 6 and 12 months, and 11 (42%) occurred more than 12 months after diagnosis. Fig. (3). Kaplan-Meier survival curves for (A) the overall cohort, (B) black women vs white women, (C) women with initial ejection fraction (EF) < 25% vs those with initial EF ≥25%. In our cohort of 59 patients, 53 (90%) were treated with ACEi/ARB, 53 (90%) with beta-blocker, 41 (70%) with an aldosterone antagonist, 33 (56%) with digoxin, 54 (92%) with a diuretic, and 2 (3%) with bromocriptine (Table 1). Of the 16 women who had deterioration in EF, 15 (94%) were treated with ACEi/ARB, 15 (94%) with beta-blocker, 9 (56%) with an aldosterone antagonist, 9 (56%) with digoxin, 16 (100%) with a diuretic, and none with bromocriptine. There was no significant association between medical therapy and subsequent deterioration (Table 1). Among the 37 women who did not recover, 33 (89.0%) were treated with ACEi/ARB, 27 (93.1%) were treated with beta-blocker, 23 (79.3%) were treated with an aldosterone antagonist, 28 (96.6%) with a diuretic, 21 (72.4%) were treated with digoxin, and 2 (6.9%) were treated with bromocriptine (Table 2). Only digoxin was statistically associated with Non-Recovery (p=0.004). 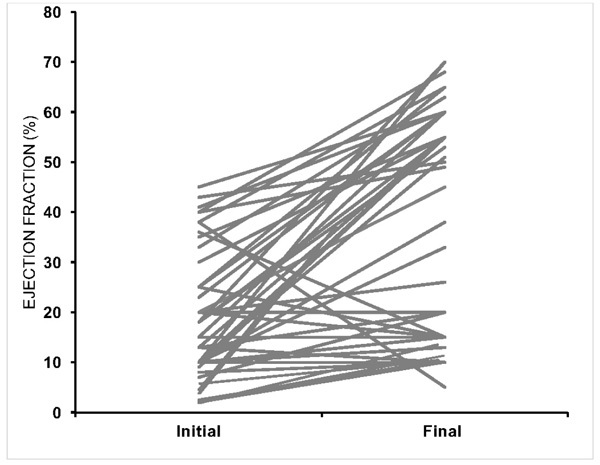 In univariate logistic regression, digoxin was associated with an OR of recovery of 0.18 (95% CI 0.05-0.6, p=0.005). Among the 19 women with MAE, 16 (84.0%) were treated with ACEi/ARB, 15 (88.2%) received beta-blocker, 13 (76.5%) with aldosterone antagonist, 16 (94.1%) with diuretic, 14 (82.4%) with digoxin, and 2 (11.8%) with bromocriptine. Digoxin and bromocriptine were both associated with MAE (p=0.005 and p=0.041, respectively) (Table 3). In univariate logistic regression, digoxin was associated with an OR of MAE of 0.15 (95% CI 0.04-0.62, p=0.009) (Table 4). Regression analysis of bromocriptine was not performed due to small sample size. This study highlights the substantial risk of long-term adverse events and mortality among women with PPCM, even beyond the first year from diagnosis and without a subsequent pregnancy. Women with PPCM can experience deterioration in EF over time, and this is associated with an increased risk of mortality and adverse outcomes. Clinically, these findings suggest that these women need close follow-up and surveillance, might benefit from prolonged medical treatment, and may warrant additional imaging to detect subclinical dysfunction. Long-term outcomes in our cohort showed deterioration in myocardial function in 27% of women with PPCM. With long-term follow-up, we found a substantial number of women with PPCM have deterioration in EF over time, even after initial improvement or recovery. Other cases of spontaneous deterioration (in the absence of a subsequent pregnancy) have been briefly identified. In a Turkish study of 42 women, four patients spontaneously deteriorated at 12, 24, 26, and 34 months after diagnosis . In a study of 46 of 182 women with PPCM who experienced major adverse events, deterioration was noted in three women, 2 of whom had previously recovered . Lastly, our group recently described the cases of 2 women (identified after the current analysis and not included in this study) with spontaneous relapse after full recovery . This suggests that women with PPCM should be counselled about the importance of ongoing surveillance and treatment by a cardiologist. Our results highlight the importance of continuing guideline directed medical therapy for patients with PPCM who have not fully recovered. In 2015, Hilfiker-Kleiner et al. published a proposed a step-wise approach to tapering cardiac medications in this population and ensuring that patients remain asymptomatic and LV function remains normal . The patients in our cohort were diagnosed prior to this publication and details about medication doses, compliance, and adjustments were not available during the time period during which our cohort was managed. In addition, only 2 of our patients received bromocriptine. Recent literature has suggested potential benefits of bromocriptine  as a way to lower levels of prolactin hormone, the breakdown products of which have been shown to influence endothelial function . However, further study is needed . The 2 patients in our study who were treated with bromocriptine ultimately had adverse events, but our study size is too small to draw conclusions. A relatively high proportion of our cohort received digoxin, and this was more common among women who did not fully recover. These patients required ongoing therapy and may not have been able to tolerate target doses of guideline-directed medical therapy due to hypotension. Prior research has addressed overall prognostic factors, but not risk factors for deterioration in EF over time. While lower baseline EF and Black race have been associated with worse outcomes and ongoing persistent LV dysfunction  , these were not identified as risk factors for subsequent deterioration in EF in our study possibly due to the small n involved. Importantly, we found that hypertension was more common among women who did not have a decline in EF. This is in agreement with a recent study by Ersboll et al. in which women with PPCM and hypertensive disorders of pregnancy were more likely to recover (66.7 vs 35.7%, p=0.016) and less likely to have major adverse cardiac events (0 vs 32.1%, p=0.0004). Additional studies have also indicated a more benign course for women with hypertensive disorders or pre-eclampsia  [27, 28], but this association is not significant in all studies [4, 29]. Lindley et al. recently demonstrated that women with pre-eclampsia and PPCM had excessive early morbidity and mortality within 1 year but survivors were more likely to show recovery of LV function . It has been hypothesized that early treatment of hypertension during pregnancy, often with labetalol, may have some beneficial effect with respect to early beta-blockade , or that if hypertension had contributed to the development of PPCM then the resolution may accelerate recovery . It is also conceivable that women with persistent hypertension may continue indefinite medication for this indication, rather than stopping cardiac medications after apparent recovery, thereby providing long-term protection against deterioration in LV function. Our long-term survival rate was lower than expected. Compared with the multi-center IPAC study , which prospectively enrolled women (n=100) with PPCM and followed them for 12 months, we had a similar percentage of Black patients (30% in IPAC vs 29% in our study). In IPAC, the 12-month mortality rate was 4%. In our study, the 12-month mortality was 5.1%, but this rose to 20% during a mean follow-up of 6.3 years. Seven deaths in our cohort occurred >4 years after the time of diagnosis, further indicating the importance of studying long-term outcomes in PPCM. Our high mortality rate may also be related to our institution serving as a tertiary care referral center for the state. Several women in our cohort were initially diagnosed at community hospitals but referred for a higher level of care, including evaluation for LVAD and transplantation. It has been previously accepted that recovery in EF frequently occurs within the first 6 months, with little change in EF thereafter, except for some cases of late recovery [12, 31]. In our cohort, less than half of the patients who recovered did so within the first 6 months and a substantial number had late recovery after 12-24 months. The majority of our patients received guideline-directed medical therapy; however, details about medication adherence and maximal doses are unknown. Late recovery could be influenced by close ongoing follow-up and aggressive medical management, but more research is needed to answer this fully. Women in our study also had a lower overall rate of recovery (37%) than that reported by IPAC (72% at 12 months) . Other studies from the United States have reported 49% recovery at 6 months  and 45% at a mean follow-up of 43 months . Compared with our study, a lower rate of recovery (23%) was reported in a retrospective study that included 55% Black women , compared with 29% Black women in our population and 30% in IPAC. Since Black women with PPCM have lower rates of recovery , our findings cannot be solely explained by differences in race. There are several other possible reasons for our low rates of recovery. First, our longer duration of follow-up (mean 6.3 years) allowed us to detect relapse and deterioration that would be missed in studies of shorter duration. Second, we opted to define recovery as an EF ≥55%, despite the fact that several other studies used a cut-off of 50%. However, even when we analyzed our rate of recovery using an EF cut off of 50% at 12-months, we found that our recovery rate (43.2%) was lower than some other reported cohorts [4, 5, 19]. One possible contributing factor is that the University of Michigan is a tertiary care center where patients may be transferred for higher level of care after not showing evidence of recovery at other hospitals. Finally, the retrospective nature of our study may have selected for patients with more severe cardiomyopathy and persistent symptomatic heart failure. Our study was limited by the nature of being a single-center, retrospective study at a tertiary referral center. In addition, echocardiography has known variability in EF measurements , which may have influenced our results. However, our findings reflect real-world clinical scenarios in which patients and physicians must make management decisions based on echocardiographic measurements. Furthermore, the fact that the group with EF deterioration had higher rates of major adverse events and lower rates of eventual recovery suggests that the decline in EF was an accurate reflection of worsening cardiac function. Additional echocardiographic parameters such as left ventricular volumes and right ventricular systolic pressure may have provided additive value and could be considered in future research. Correlation of echocardiographic measurements with cardiac MRI would have improved the accuracy of EF determination, but the majority of our patients were managed prior to widespread use of cardiac MRI. Another important limitation in this retrospective study is that specific data about medication treatment, duration, dosing, and compliance was unavailable; thus, our findings related to medical treatment should be interpreted with caution. Women with PPCM can have an unpredictable long-term course. Patients may deteriorate over time, even in the absence of a subsequent pregnancy. Deterioration in EF is associated with major adverse cardiac events. Our study suggests that close, long-term follow-up of women with PPCM is essential. Approval was obtained from the University of Michigan Institutional Review Board. Sliwa K, Hilfiker-Kleiner D, Petrie MC, et al. Current state of knowledge on aetiology, diagnosis, management, and therapy of peripartum cardiomyopathy: a position statement from the Heart Failure Association of the European Society of Cardiology Working Group on peripartum cardiomyopathy. Eur J Heart Fail 2010; 12(8): 767-78. Gentry MB, Dias JK, Luis A, Patel R, Thornton J, Reed GL. African-American women have a higher risk for developing peripartum cardiomyopathy. J Am Coll Cardiol 2010; 55(7): 654-9. Blauwet LA, Libhaber E, Forster O, et al. Predictors of outcome in 176 South African patients with peripartum cardiomyopathy. Heart 2013; 99(5): 308-13. McNamara DM, Elkayam U, Alharethi R, et al. Clinical Outcomes for Peripartum Cardiomyopathy in North America: Results of the IPAC Study (Investigations of Pregnancy-Associated Cardiomyopathy). J Am Coll Cardiol 2015; 66(8): 905-14. Amos AM, Jaber WA, Russell SD. Improved outcomes in peripartum cardiomyopathy with contemporary. Am Heart J 2006; 152(3): 509-13. Duran N, Günes H, Duran I, Biteker M, Ozkan M. Predictors of prognosis in patients with peripartum cardiomyopathy. Int J Gynaecol Obstet 2008; 101(2): 137-40. Afana M, Brinjikji W, Kao D, et al. Characteristics and In-Hospital Outcomes of Peripartum Cardiomyopathy Diagnosed During Delivery in the United States From the Nationwide Inpatient Sample (NIS) Database. J Card Fail 2016; 22(7): 512-9. Kao DP, Hsich E, Lindenfeld J. Characteristics, adverse events, and racial differences among delivering mothers with peripartum cardiomyopathy. JACC Heart Fail 2013; 1(5): 409-16. Kolte D, Khera S, Aronow WS, et al. Temporal trends in incidence and outcomes of peripartum cardiomyopathy in the United States: a nationwide population-based study. J Am Heart Assoc 2014; 3(3): e001056. Cooper LT, Mather PJ, Alexis JD, et al. Myocardial recovery in peripartum cardiomyopathy: prospective comparison with recent onset cardiomyopathy in men and nonperipartum women. J Card Fail 2012; 18(1): 28-33. Goland S, Bitar F, Modi K, et al. Evaluation of the clinical relevance of baseline left ventricular ejection fraction as a predictor of recovery or persistence of severe dysfunction in women in the United States with peripartum cardiomyopathy. J Card Fail 2011; 17(5): 426-30. Biteker M, Ilhan E, Biteker G, Duman D, Bozkurt B. Delayed recovery in peripartum cardiomyopathy: an indication for long-term follow-up and sustained therapy. Eur J Heart Fail 2012; 14(8): 895-901. Fett JD, Christie LG, Carraway RD, Murphy JG. Five-year prospective study of the incidence and prognosis of peripartum cardiomyopathy at a single institution. Mayo Clin Proc 2005; 80(12): 1602-6. Elkayam U. Risk of subsequent pregnancy in women with a history of peripartum cardiomyopathy. J Am Coll Cardiol 2014; 64(15): 1629-36. Safirstein JG, Ro AS, Grandhi S, Wang L, Fett JD, Staniloae C. Predictors of left ventricular recovery in a cohort of peripartum cardiomyopathy patients recruited via the internet. Int J Cardiol 2012; 154(1): 27-31. Biteker M, Duran NE, Kaya H, et al. Effect of levosimendan and predictors of recovery in patients with peripartum cardiomyopathy, a randomized clinical trial. Clin Res Cardiol 2011; 100(7): 571-7. Pillarisetti J, Kondur A, Alani A, et al. Peripartum cardiomyopathy: predictors of recovery and current state of implantable cardioverter-defibrillator use. J Am Coll Cardiol 2014; 63(25 Pt A): 2831-9. Lang RM, Badano LP, Mor-Avi V, et al. Recommendations for cardiac chamber quantification by echocardiography in adults: an update from the American Society of Echocardiography and the European Association of Cardiovascular Imaging. Eur Heart J Cardiovasc Imaging 2015; 16(3): 233-70. Goland S, Modi K, Bitar F, et al. Clinical profile and predictors of complications in peripartum cardiomyopathy. J Card Fail 2009; 15(8): 645-50. Mahowald MK, Davis M. Case Series: Spontaneous Relapse After Recovery From Peripartum Cardiomyopathy. Clin Med Insights Case Rep 2017; 10: 1179547617749227. Hilfiker-Kleiner D, Haghikia A, Nonhoff J, Bauersachs J. Peripartum cardiomyopathy: current management and future perspectives. Eur Heart J 2015; 36(18): 1090-7. Hilfiker-Kleiner D, Haghikia A, Berliner D, et al. 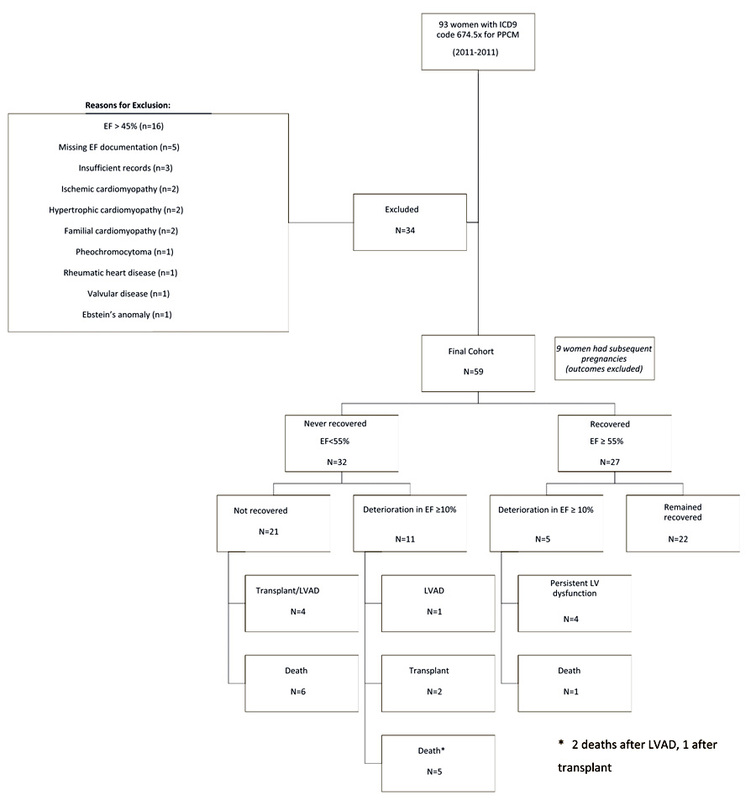 Bromocriptine for the treatment of peripartum cardiomyopathy: a multicentre randomized study. Eur Heart J 2017; 38(35): 2671-9. Patten IS, Rana S, Shahul S, et al. Cardiac angiogenic imbalance leads to peripartum cardiomyopathy. Nature 2012; 485(7398): 333-8. Fett JD. More study still needed on the use of bromocriptine in the treatment of peripartum cardiomyopathy. Eur Heart J 2018; 39(43): 3904. Irizarry OC, Levine LD, Lewey J, et al. Comparison of Clinical Characteristics and Outcomes of Peripartum Cardiomyopathy Between African American and Non-African American Women. JAMA Cardiol 2017; 2(11): 1256-60. Ersbøll AS, Johansen M, Damm P, Rasmussen S, Vejlstrup NG, Gustafsson F. Peripartum cardiomyopathy in Denmark: a retrospective, population-based study of incidence, management and outcome. Eur J Heart Fail 2017; 19(12): 1712-20. Haghikia A, Podewski E, Libhaber E, et al. Phenotyping and outcome on contemporary management in a German cohort of patients with peripartum cardiomyopathy. Basic Res Cardiol 2013; 108(4): 366. Kamiya CA, Kitakaze M, Ishibashi-Ueda H, et al. Different characteristics of peripartum cardiomyopathy between patients complicated with and without hypertensive disorders. Results from the Japanese Nationwide survey of peripartum cardiomyopathy-. Circ J 2011; 75(8): 1975-81. Li W, Li H, Long Y. Clinical Characteristics and Long-term Predictors of Persistent Left Ventricular Systolic Dysfunction in Peripartum Cardiomyopathy. Can J Cardiol 2016; 32(3): 362-8. Lindley KJ, Conner SN, Cahill AG, Novak E, Mann DL. Impact of Preeclampsia on Clinical and Functional Outcomes in Women With Peripartum Cardiomyopathy. Circ Heart Fail 2017; 10(6): e003797. Arany Z, Elkayam U. Peripartum Cardiomyopathy. Circulation 2016; 133(14): 1397-409. Wallerson DC, Devereux RB. Reproducibility of echocardiographic left ventricular measurements. Hypertension 1987; 9(2 Pt 2): II6-II18.